Mr. K and I have consumed a ridiculous amount of cheese this year, mainly from grilled cheese sandwiches and cauliflower creations. I didn’t realize how much cheese we were eating until I was rummaging through the fridge and realized we were down to our last bar of Cabot cheese. This is particularly alarming because in March, I won $150 worth of Cabot cheese in a raffle contest, half of which was shipped to me at the end of March and half to be shipped to me in October. We’re still two months away from October and I’m already almost completely out of my first shipment of cheese. Eeek. It was worth using up some premium cheddar cheese on these sandwiches though. 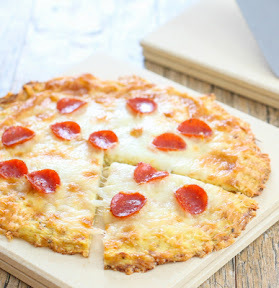 They are so flavorful and the cauliflower crust holds up rather well. I can’t claim credit for this genius creation. It came from The Iron You and he basically took the method for making cauliflower pizza crust or cauliflower breadsticks and made them into bread slices instead. I made some tweaks to the recipe and methodology and my adapted method is below. New! Recipe now updated with video. You can find all my recipe videos on my youtube channel. Preheat oven to 450°F. 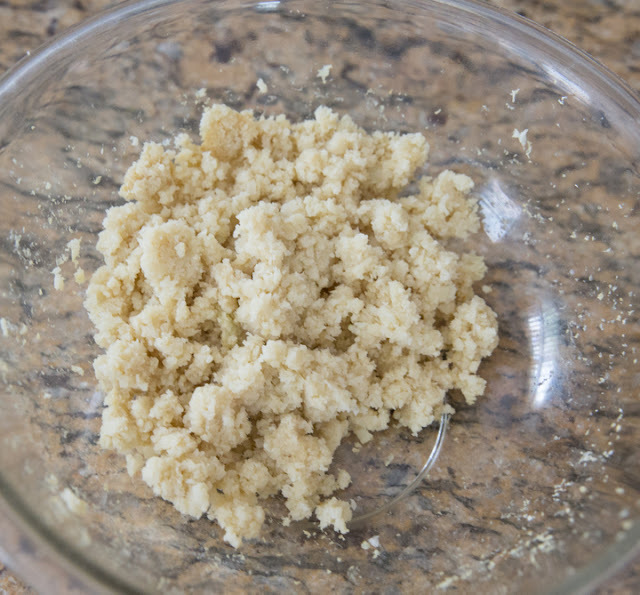 Place cauliflower into food processor and pulse until crumbs about half the size of a grain of rice. Stir cauliflower to mix up the bottom and top cauliflower. Place back into the microwave and cook for another 3 minutes. Remove and stir again so that all the cauliflower cooks evenly. Place back into microwave and cook for 5 minutes. At this point, you should see the cauliflower is starting to become more dry. Microwave for another 5 minutes. Cauliflower should still be slightly moist to the touch, but should look dry and clumped up (like photo above; similar to as if someone had chewed it up and spit it back out.) If you've made cauliflower pizza or breadsticks with the cloth wringing dry method, it should look the same. Allow cauliflower to cool for a few minutes. Then add in egg and cheese. Stir to combine until smooth paste forms. Stir in seasoning. Divide dough into 4 equal parts. Place onto large baking sheet lined with parchment paper. Using your knuckles and fingers, shape into square bread slices about 1/3 inch thick. 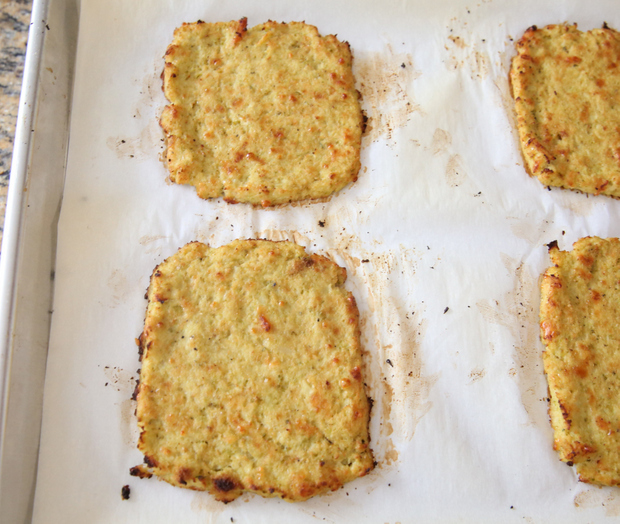 Bake cauliflower bread for about 15-18 minutes or until golden brown. Remove from oven and let cool a few minutes. 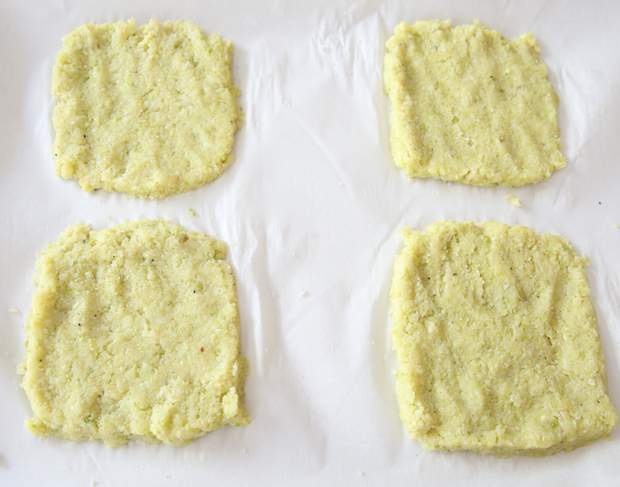 Using a good spatula, carefully slide cauliflower bread off of parchment paper. Now you are ready to assemble your sandwiches. You can do this a few different ways. You can either cook on the stove top as you would normally cook a grilled cheese. 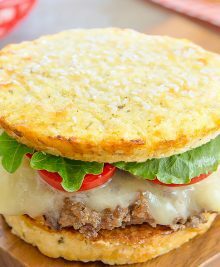 You can also place sandwiches into toaster oven and broil for several minutes (5-10) until cheese is completely melted and bread is toasty. If you don't own a toaster oven, you can also do this in the oven. Check out all my cauliflower recipes here! Cabot cheese is so good! probably part of why I’m almost out is that I keep just eating it by itself! You never said when to use the Parmesan. Can I use the oven instead of the microwave to heat up the cauliflower? What is the carb per sandwich? there are several sites out there that calculate nutritional value of recipes such as caloriecount.com, so you can try using those sources to figure it out. hope that helps! I tried this last night, and had some questions. The ingredients say 1 egg, but the instructions say “eggs” and one of your comments here says to add the parmesan “with the eggs”. So….how many eggs? Can the steamed cauliflower be frozened? Or the “bread”? I spread the puree in a fairly thin layer over my Silpat sheet, then make cut lines with a knife. After baking the recommended time, I gently flipped the pieces over. After baking longer, I put it under the broiler for a few minutes. I left it on the tray over night, but I should have put them on a cooling rack to air dry a bit. However, I was still able to pan fry it. My daughter and I had some for breakfast and it was really good! yikes, sorry about that! it is indeed just 1 egg! I’ve corrected the directions section to reflect that. I haven’t tried freezing the cauliflower bread of the the cooked cauliflower before, so unfortunately I don’t know the answers to those questions. How long do these last in the fridge? Do you think they can be frozen and reheated? Crazy question… Does the cauliflower have that distinct cooked cauliflower smell when microwaved and dried? I love raw cauliflower (and broccoli) but can’t stand the smell of either when cooked. Yes it does have the smell of cooked cauliflower. I’ve experimented with cauliflower pizza but have used almond flour too. What do you suggest for preventing the bread from sticking while cooking because of the cheese? LOVED THESE!! I just made these for the 1st time & loved them! I didn’t have any white cheddar so I used slices of velveeta. I will definitely be making these again! Gotta get me some white cheddar!! They turned out perfectly! I could lift them easily and think I would melt the cheese in a fry pan next time. Thanks for sharing this great recipe, one sandwich is VERY filling. Just made this for breakfast with a bit of ham and gruyere. It was fabulous! Next time I am going to try to measure before I make the slices so I can get a more predictable slice size and carb count. Thanks for figuring it out. Ham and gruyere sounds so delicious with these! Yummy! I needed to use leftover cauliflower and came across this. Ok, I should have started it well before I did. It does take awhile to make but I followed your recipe and Love it! Who knew!? So glad you enjoyed it! The first time it took me awhile to get the hang of it, but after you’ve done it once, I think the recipe should go much faster! Hi, the link for the method of steaming and drying the cauliflower (we don’t have a microwave) doesn’t work. You can also put the riced cauliflower in a non stick frying pan and toss over medium heat to dry the cauliflower out. The less you hear of the sizzle and steam the dryer your cauliflower is getting. This is the most preferred method I have found that works perfectly for me! Thank you KIRBIE i just made this for us and it was absolutely magnificently Delicious!!!! Super thank you for this amazing recipe!!!!!! !1st time and i can confess i am addicted!!!!!! Can you use frozen cauliflower to start with? I can’t wait to try this! I haven’t tried, but I think so! you might have to spend more time drying the cauliflower if it’s frozen though, so keep that in mind! If using the microwave steam in bag cauliflower, do you suggest I follow the directions on the bag then put it in the food processor and continue the steps for this recipe? The cauliflower becomes somewhat soft. Or should I process it frozen, or maybe just steam it for a minute or two instead of the full 5 so that it’s still hard? Hi Christine- When you say bag cauliflower, are you talking about the frozen cauliflower that is already riced or a bag of frozen cauliflower florets? I haven’t worked with frozen prepackaged cauliflower yet, but I would think that you would just open the cauliflower, pulse in food processor if it’ not already finely riced, and follow the recipe and don’t do anything on the bag to cook it. The cauliflower will get cooked in the microwave first and then slowly get dehydrated as you continue to cook it longer. Your cooking time will probably be more or less depending on the kind of prepackaged cauliflower you are using, so don’t completely rely on the times set in the recipe. if it’s frozen raw cauliflower, i think it will take longer to dehydrate. if it’s already cooked frozen cauliflower, it will probably take less time. hope this helps! this recipe looks wonderful and i will try it. however, i think since this is food based you could have used a more appetizing analogy than “Cauliflower should still be slightly moist to the touch, but should look dry and clumped up (like photo above; SIMILAR TO AS IF SOMEONE HAD CHEWED IT UP AND SPIT IT BACK OUT. )” c’mon really? I don’t often mix unappetizing images or thoughts with food posts, but in this case, it is what I believe to be the best description of what the end result is supposed to look like. And I think having the most accurate description is best otherwise it can be confusing for someone making it for the first time. These look so good. Can these be frozen for later use? 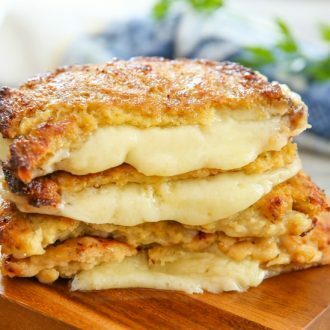 I don’t like cauliflower at all but I do eat low carb and this looks amazing, I love grilled cheese sandwiches so this will take out all the carbs I get with the regular one, the carbs will come in with the cheese and herb seasoning which is it a dry season or a liquid so I think it would be real low. Now I am from Louisiana and you saying chewing it and spitting it out didn’t bother me one bit because your not telling people to do that but only that it looks like that. Thank for your comment! The herb seasoning is a dry mix. I’m glad you weren’t bothered by that description because I wasn’t either. It was the first I’ve heard of someone being upset by it! oh yay! So glad your family liked them so much! Kirbie, this looks amazing! Thank you for sharing! 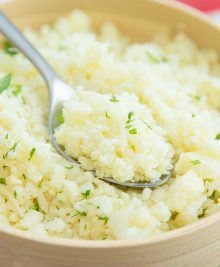 I just recently started a low-carb diet and I see a lot of recipes using cauliflower as a substitute for bread or potatoes. Do you think other vegetables can be used instead of cauliflower, like broccoli for example? I have not tried, but I think it should work. You may have to tweak the other ingredients a little. the sandwiches half way through to get them crispy on both sides? It’s up to you. You definitely can. I actually had mine on the wire rack in my toaster oven, so both sides were able to crisp up, though the top was obviously more crisp than the bottom. I have my cauliflower riced and frozen in freezer…can I get a approximation of how much (cups, grams?) to make this recipe? Thanks …really want to give it a try! The wringing instructions link is broken…can you please fix it? We don’t have a microwave so can’t do it that way. This looks awesome, can’t wait to try it. Thanks! Do you leave the cauliflower uncovered when you are cooking it in the microwave or do you cover it the way you are supposed to cover regular food? I can’t wait to try all your recipes. I found you by accident. So glad l did???????????? I’m so glad you did! hope you enjoy! Has anyone tried melting the sandwich in a small George Forma-type grill or a panini grill? That’s how I always make my grilled cheese sandwiches. You may want to mention to add the egg after the cauliflower has cooled; otherwise, the egg will cook. I plan to try this! good idea. I always pile on the other ingredients before the egg, but I will add that to the directions. Any suggestions for someone who can’t have eggs? It takes just two ingredients: flaxseed meal (Bob’s Red Mill is one brand, check a health food store or Amazon for others)–(or you can buy flax seeds and grind your own) and water. The recipe is: 1 Tablespoon of flaxseed meal mixed then cooled with 3 tablespoons of water = one chicken egg. Mix the flaxseed meal with the water well then put it in the refrigerator for about 20 or 30 minutes to thicken (it will take on a gelatinous texture–a lot like an egg!). Once its thick and goopy use it just like an egg. What else can be used if I don’t have a food processor?? I’ve tried this recipe and it came out fantastic! I used gouda instead of partisan, it worked just fine. Thank you for sharing this great recipe, it really helps on days when I’m craving a sandwich. PS, my husband too loves the sandwich and he’s very hard to convince! Thanks once again. yum, love gouda! so glad you and your husband are enjoying this! And it’s so cool you are reading this from South Africa! I make this all the time. I absolutely love this. I never did precook it ad was delishous making raw. Made this tonight using the pre-done cauliflower rice in the refrigerated section of Trader Joes. LOVED it! I followed the instructions exactly (except subbed mozz. for parm because it was what I had) and it still turned out just fine Also added in some different dried herbs to add flavor and it worked out great. Thank you for this recipe and sooo glad I found it! (Also a lot easier doing the microwave process then squeezing out all the water.) Will definitely make this again! Looks scrumptious, Would baking the cauliflower in the oven for about 10 min dry it out? I don’t have a microwave & haven’t been successful wringing out enough water. Thanks. Thanks so much for explaining. I was looking for a way around squeezing because of problems with my hands. I hope you like this method as much as I do! This turned out perfectly! I made the “slices” about 1/4 inch thick instead of 1/2. 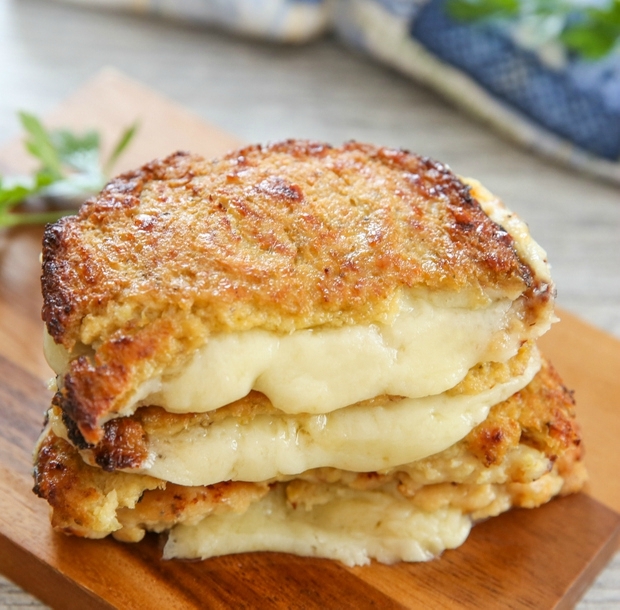 Working with Cauliflower is a huge pain in the rump and there’s little bits all over my counter, but this is the best recipe I have tried with cauliflower since it is dried out so much. Everything else I have tried has fallen apart. Thank you! yay! I’m so happy to hear that. I agree that cauliflower can get messy. But I do find that the microwave method helps to minimize some of that mess since you don’t have bits of cauliflower stuck on a wringing cloth. I think the taste ends up being worth it though! Can you freeze the cauliflower slices? I am in the process of making these. So excited for the end results! So I found it easier to use a small baking spatula and eggrings to form them and they are perfectly round! I have made these and loved them! Even my children are a huge fan ! I added chia seeds in as well…….as they are super nutritious, and do not change the flavor in any way ! so glad you enjoyed these! and what a great idea to add chia seeds! My first riced cauliflower recipe and it came out fantastic. I can now have grilled cheese sandwiches again! Thank you. It would be nice to include alternate directions for those who do not use a microwave. I commend you on your patience and willingness to gracefully answer similar questions repeatedly. Can’t wait to try this recipe. I miss grilled cheese! Hey Kirby, thank you for sharing, If I understand the cauliflower needs to be dried, could this be done in a dehydrator? I boughtvsome frozen riced cauliflower and I have a dehydrator. I haven’t tried in a dehydrator before, but it should work! 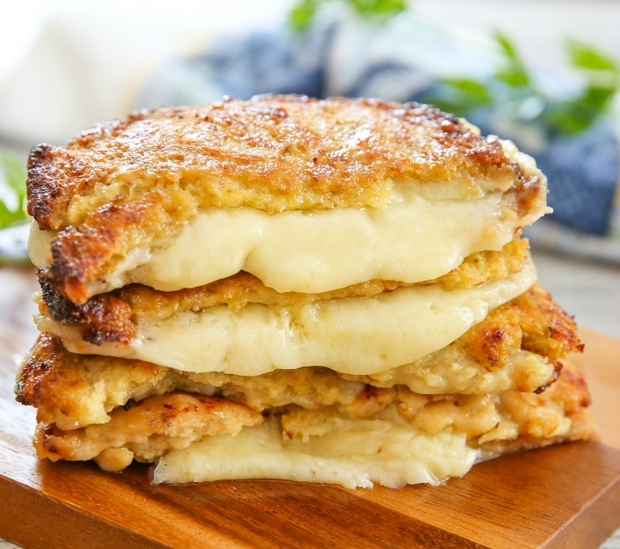 I’m a late starter with the cauliflower food ideas but I have to say I’m so happy I started with your grilled cheese sandwiches. These are delicious and surprisingly hearty! Love them! Yay I’m so glad you liked these! I had VBS ( vertical bariatric sleeve) surgery a month ago for weight loss so I have to watch my carbs. This recipe was great for great for getting protein without a lot of carbs. It is also very filling. The only mistake I made was not patting it out thin enough. I really loved the taste without the guilt. Thanks for sharing. I will be making it again. Hi, do you butter the outside of the cauliflower ‘bread’ like you would with a normal grilled cheese sandwich? I’m desperate for a grilled cheese sandwich! I didn’t because I was trying to keep it healthier. But you definitely can to help crisp up the outside of the bread even more. 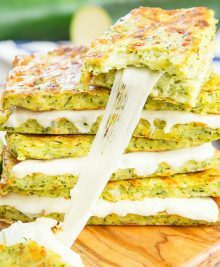 I am going to try this soon, but I’m wondering if you could use a waffle maker to cook the slices instead of the oven? It’s hot as Hades here in Texas and I avoid the oven like the plague in the summer. I saw a recipe that make “bread” from tater tots in a waffle iron, and that’s what has me wanting to experiment with this recipe. I think that should be fine! I’ve done a lot of waffles breads, though not for this particular recipe, but they usually turn out well. Making them now – mine are sticking to the parchment paper & falling apart. A little bummed about that. Guess next time I need to spray nonstick oil. I didn’t see anyone else having issues with that. Am I the only one? Every time I bake something with cauliflower that happens. Any ideas as to why? Hmm that is strange. Have you tried baking them longer? perhaps they aren’t quite ready yet which would cause them to stick. Where do I find the nutrition information for your recipes? I’m a newly-diagnosed diabetic and I need to see the carb count for the recipes that I try. I’m trying to keep my sugars way down. Thank you. I just found the nutrition info in a comment above. Thanks. Hi there, the video is for this recipe: https://kirbiecravings.com/2016/07/cauliflower-bread-buns.html and I talk more and link to the pan in the post. Has anyone been successful in making this bread dairy-free? I was thinking of using NUTRITIONAL YEAST instead of the Parmesan. Thoughts? While this does look delicious, its FAR from vegan. Vegan means no animal products. Cheese and eggs are both from animals and therefore do not classify as vegan in any way, therefore neither does this yummy looking sammy! I do not claim that the recipe is vegan anywhere in this post. Can you use a bag of cauliflower rice? If so how much for the ratio above? yes you can. Unfortunately I do not know how many cups of riced cauliflower you would need as I usually just rice the full head of cauliflower. I had issues with the cauliflower falling apart and not binding well… would you recommend a 2nd egg? This was my first time trying any type of cauliflower bread, and it was SO GOOD ? Will definitely be using this again! Is it possible to cook them in a skillet (with butter), maybe add one more egg or more parmesan so they can stick well together? I tried the oven version and it’s amazing! WOW! This was amazing! I can’t believe how good it was! I used frozen riced cauliflower. Thanks for the recipe. Hi! 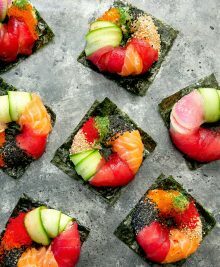 I want to make these today but don’t have any parchment paper. Can I just grease the pan to prevent sticking? ? I don’t recommend just greasing the pan as these are delicate and hard to remove without parchment paper or a silicone baking mat. Just made this and it turned out great! A little bit time consuming to cook the cauliflower in the microwave but worth it. The cauliflower was dry enough and easy to shape without falling apart. After cooking in the oven I fried it in the frying pan with a bit of olive oil until the cheese was nicely melted. Yummy yummy! Thanks for the recipe……….definitely a keeper! This was the third time trying to make cauliflower grilled cheese and succeded. The other times I ended up with a great fried caulirice. Thanks for sharing. I’m so glad you got it to work! Doing Keto and keto 7.4 g of carbs per slice is ALOT… Where are the carbs coming from? it’s a lot of cauliflower per slice since the cauliflower is dehydrated. Kirbie – I’ve tried at least 4 other cauliflower crust recipes and yours is by far the best – I love the drying out process in the microwave it worked so well – I used grated parm since I didn’t want to run out to the store for shredded and it held together well – I will certainly check out your other recipes and look forward to making them. I am so thrilled you like this one the best! PLEASE SHOW ME WHERE I’M INCORRECT. Hi there. It looks like maybe one of the ingredients you selected when calculating produced incorrect nutrition numbers as your calculation is pretty far off from what I calculated. How many carbs you are able to consume really depends on what low carb diet you’re following as they vary in the amount of carbs allowed. But I think 17 grams per sandwich is within the acceptable range of most low carb diets. Hi! This looks delicious! Not sure if you can answer this, but when looking at the nutritional information, it says that the recipe has 17 carbs. Just wondering where the carbs are coming from… all of the ingredients are either low-carb or carb free. Thanks for any insight you can provide! Have a great day! the majority of the carbs come from cauliflower. Keep in mind one sandwich contains half a head of cauliflower. You can use an online nutritional calculator to get a complete breakdown of ingredient nutritional values. Would the cauliflower still have good nutritional content after cooking for 15 minutes in the imicrowave? If you are concerned about the cauliflower losing too much nutritional value, you can also steam and wring dry with a cheesecloth, the alternative method I mention in the recipe.